This event will last approximately 2 hours. Is there a song you’ve been dying to perform that traditionally wouldn’t be sung by someone who looks like you? 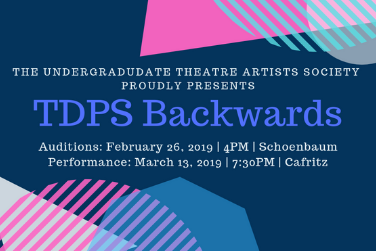 TDPS Backwards is here to shatter those gender norms and give students a space to sing ANY broadway song they want regardless of gender identity, race, age, etc. Inspired by Broadway Backwards, UTAS felt a need to have a fun night where students could sing songs from their favorite musicals regardless of how it is/was originally performed. Voluntary donations received the night of the performance will go to Broadway Cares’ initiative to finding a cure for AIDS. Come out and have a blast with us as TDPS students and friends sing their heart out! 16 hours 45 min ago.